The new 2MASS Redshift Survey (2MRS) mapCovering 95 per cent of the sky in the infrared part of the spectrum, shows the distribution of galaxies and dark matter that make up the local Universe up to 380 million light years away. The map also shows more distant objects. The purple areas denote galaxies closest to Earth, whist the red areas are the furthest, lying about 1 billion light years from Earth. The map is based on data gathered in the southern hemisphere by the 1.2-metre Schmidt telescope in Siding Springs, Australia, and in the northern hemisphere by the 1.2-metre telescope at the Fred Lawrence Whipple Observatory in Arizona. 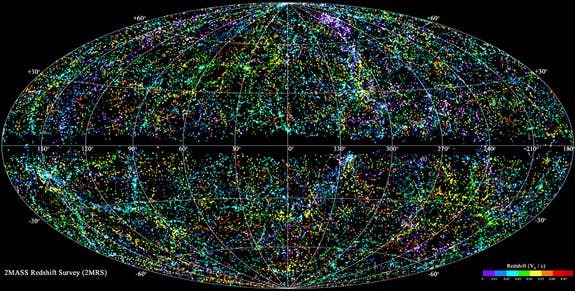 Altogether, the maps shows approximately 45,000 galaxies.